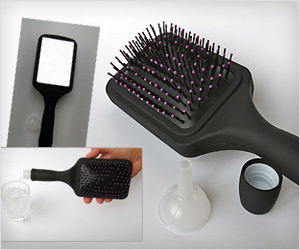 Picture this, a high quality hair brush with looking mirror on the other side. All this comes within a secret flask that can hold 6 oz. of alcohol or water. It is by far is best flask specially made for women. So you can take care of hair with fully functional paddle brush. Then use mirror on other side to see if everything looks perfect.